Today, I’d like to share tips on consuming wild edibles during your next adventure. For visitors and natives of the Northwestern United States, I have created a list including a few foods that can be eaten in the wild, some nutrition facts, identification, and food preparation ideas. Whether you are looking for safe foods in a survival situation or just want a taste of the delicious bounty on the wild side of the supermarket, this guide can help. Disclaimer: Make sure you are confident in the identification of plants, and when in doubt, do not eat it. Also be sure to look at the surroundings of where these plants are grown. Do not harvest from places that are contaminated. Avoid any areas sprayed with pesticide, herbicide, or other chemicals. Pine nuts are actually seeds. The largest are produced by Pinyon Pines, but those don’t grow in the Northwest. Seeds may be harvested from any pine, spruce, or fir, but some seeds can be very labor intensive compared to seeds yielded. 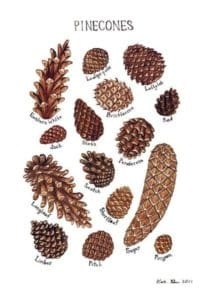 Spruces, firs, and Lodgepole Pines yield seeds that are easier to harvest but smaller, so more cones are needed. Pine nuts are seasonal and are best harvested during September and October. Harvest cones that are open and have fallen on the ground or put the cones next to a fire (or in a pot on the fire), for them to open up and release their seeds. They may be eaten raw, roasted, or toasted. Pine nuts provide about 380 calories per 1/4 cup and are full of heart-healthy fats. They are also a good source of fiber, protein, magnesium, vitamin E and zinc. They are a great, nutrient dense food if you can find cones that easily release the seeds. The needles and inner bark of most pines are also edible with the exception of the Ponderosa Pine. 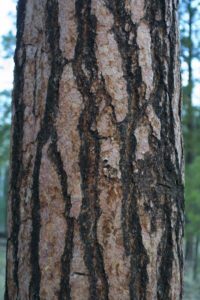 Ponderosa trees can be identified by their brown-orange and vertically oriented pattern of bark (see pictures below). To harvest bark, remove the outer bark to reveal the inner bark still on the tree. Then, remove inner strips from several different trees to avoid severely harming one tree. It can be eaten raw, but it is better to boil it to avoid stomach cramping. Pine needles can be used to make a tea. Just chop them up (without cones and branches) and put them in boiling water. Let it steep, and strain needles before drinking. The inner bark and needles provide a great boost of vitamin C and fiber. 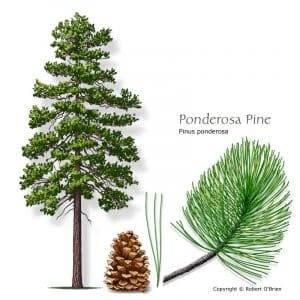 Avoid eating the needles and inner bark of the Ponderosa Pine tree. These wild pink roses become fruits called hips, which are tangy, sweet, and a vitamin C powerhouse. They also contain high levels of polyphenols and plant sterols that have been found to help prevent cancer and heart disease in the context of a healthy diet. Eat the outer skin of the hip and remove the mass of seeds. Leaves and flowers are also edible and are great additions to drinks or foods. Pick them one week or so after the first frost or late fall. Look for deep red rose hips that are slightly soft. If you like more tang, harvest a little earlier. 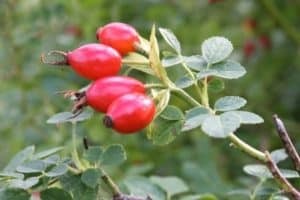 The rose hips have compound leaves and thorns on the rose bushes and branch upwards. Give this Wild Rose Hip Tea recipe a try! Yucca plants have large white or yellow (sometimes purplish) flowers that bloom off a long spike in the center of the green, spiky plant. Young stalks are edible, which grow between the leaves. The stalks can be roasted over hot coals, about ten minutes each side for the larger ones. The tender flowers taste the very best and are wonderful eaten alone or added to salads or sautéed in other dishes like omelets (a dish unlikely eaten in the backcountry scenario but otherwise fantastic—add in veggies for more flair). 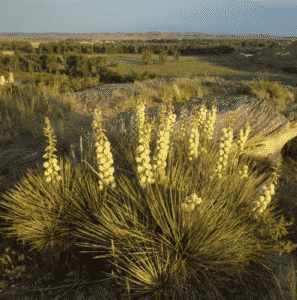 Flowering of the yucca occurs from May to July. No nutritional information pertaining to yucca flowers is available. When the stalk has dried, it makes for great fire tinder. The flowers can also be added to water and scrubbed to make a natural soap. Give this Yucca Flower Omelet recipe a try! Wild onions have a strong onion-like odor and have little stems with buds that blossom at the top. Avoid any similar plants that lack an onion odor because some are poisonous. Before the buds blossom, they can be eaten and taste like onion. 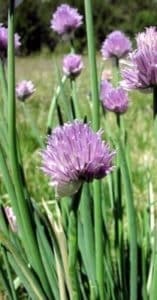 The leaves and stems can be eaten like chives, and if you want to dig, the bulbs at the bottom can also be eaten like any onion. Wild onions are an excellent source of vitamin C and fiber. They also contain high amounts of easier-to-absorb quercetin, which is an antioxidant responsible for elimination of free radicals, helping reduce inflammation, prevention of low-density lipoprotein oxidation which is a reaction involved in atherosclerosis and coronary heart disease, and protection and regeneration of Vitamin E (another powerful antioxidant). 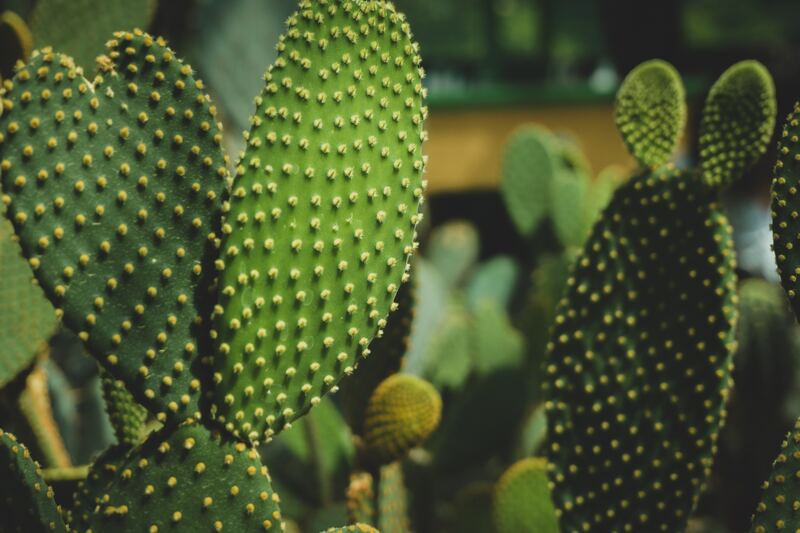 The inside pulp of a cactus is a delicious way to help contribute to hydration. 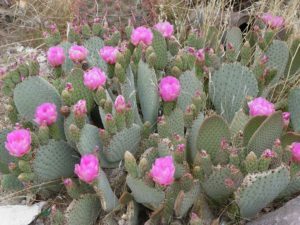 Pull the needles off with pliers, and scrape the outer skin off the cactus pads with a pocketknife. It may be eaten raw or cooked. The fruits that grow on the cactus that grow the blossoms can be eaten in the same way. Cactus can be harvested year round. Cactus is low in calories, which is not always optimal for the backcountry, but it is a great source of vitamin C and fiber. Give this Grilled Cactus Recipe a try! There are a variety of fish available to the Northwestern United States. Fish are high in protein, B vitamins, phosphorous, and selenium. 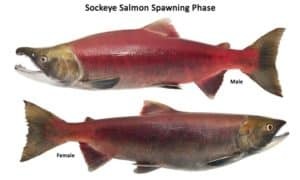 Some trout are high in omega-3 fatty acids, but the Sockeye Salmon will be a better source than the Rainbow Trout. Omega-3’s have been shown to protect the heart, support brain function, fight inflammation and contribute vitally to growth and development. Check out this article for ways to rig a fishing contraption in a survival scenario. Stay tuned for Wild Edibles of the Northwest – Part Two where I talk about how to safely consume cattail, various wild berries, sunflowers and dandelions while adventuring in the backcountry. Be sure to subscribe to this blog so that you don’t miss out on future posts providing unique information related to backcountry travel. Rachel Patrick, RDN, LD is a Registered Dietitian Nutritionist at the Gallatin Valley YMCA in Bozeman, MT and offers sports nutrition coaching and workshops. For more information relating to the article or to find out how you may benefit from nutrition coaching, contact her at r.patrick5320@gmail.com. You can also follow her on Instagram and Pinterest @staminabzmn. 5. Kavanagh & Leung. (2017). Edible wild plants: A folding pocket guide to familiar North American species. Waterford Press.